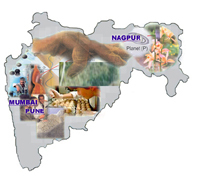 The Maharashtra Academy of Sciences is the premier scientific learned society of the state of Maharashtra. It was established in 1976 with the specific aim to highlight the scientific and technological issues confronting the state, and to recommend appropriate steps necessary to be under taken by the concerned authorities for the promotion of science and technology. The academy has very wide spectrum of interests and has scientists of eminence as its fellows in all the major scientific disciplines. The list of fellows includes eminent scientists in Maharashtra and some outside the state who are interested in the promotion of science and technology and have in particular special attachment to Maharashtra. It has also fellows from industry who have made a name in their respective fields. The fellowship of the academy is conferred upon senior scientists after a peer-group assessment based on their scientific achievements as is practiced in the national academies of India and in the prestigious academies abroad. The first President of the academy was Dr. H. N. Sethna, the then Chairman of the Atomic Energy Commission, who guided the deliberations of the academy in its formative stages. Presentation of recommendations for the education of groundwater resources of the state. Assessment of the impact of the Thal-Vaishet fertilizer complex on the Alibag Magnetic Observatory. Presentation of geological sites in the state. National seminar on Biodiversity and sustainable developments. Celebration of the century of the discovery of X-ray and of radioactivity at various places. Science education discussions from time to time and publication of detail report in the book by Dr. M. R. Bhiday. Several seminars on important topics and lectures by eminent scientists. Seminar on "Plastics: Bane or Benefactor". At present, there are more than 650 fellows of the Academy covering the disciplines of Physical Sciences, Chemical Sciences, Earth Sciences, Life Sciences, Medical Sciences, Mathematical Sciences, Agricultural Sciences, Social and Educational Sciences, Engineering and Technology, Economic Sciences, Management Sciences, Computer and allied Sciences and Environmental Sciences. There is also a provision for making honorary fellows, patrons, associate members, young associates, donor members, corporate members and industrial members. The academy is now planning in a major way to welcome in its fold Indian scientists residing abroad, who are specially interested in the welfare of Maharashtra.